Welcome to Matthew S. Rotundo's home page. 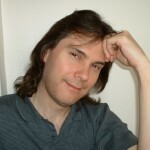 Matt is an award-winning writer of science fiction, fantasy, and horror. Read more about him here. Sign up here to be notified about new releases and other news of interest from Matthew S. Rotundo. Your email address will never be shared and you can unsubscribe at any time. Joyous day! Word has reached me that Joe Bonamassa, the Greatest Guitarist Alive (TM), is finally returning to my hometown! It’s been over a year. I was beginning to think he didn’t like us anymore. But come October 1st, it’s a par-tay at the Whiskey Roadhouse. Completed the first act, and am now embarked on a second act that’s pretty much a complete mystery. I know where I want everyone to end up, but I have no idea how I’m going to get them there. I’m sure I sound like a broken record by now, but this really is happening every week, and it’s scary. Every day I go to the keyboard fearing that I will face a blank screen for two hours. Every day I manage to bang out just a little bit more, but in truth, it feels like I’m just delaying the inevitable, that sooner or later, my luck–or inspiration, or whatever it’s been so far–will run out. Maybe if I get a minute, I’ll ask my muse. I seem to recall having a similar conversation with her during the drafting of Petra. Here’s hoping she’s as forthcoming this time around. Since I’ve hit the 40K mark, I’m officially working on a novel now, according to SFWA rules. So that’s something. No updates for Write Club. Copyright © 2019 MATTHEW S. ROTUNDO'S PIXELTOWN. All Rights Reserved. Blog by Wordpress | Free Theme Provided by gadgets wordpress themes and Sponsored by used macbooks.